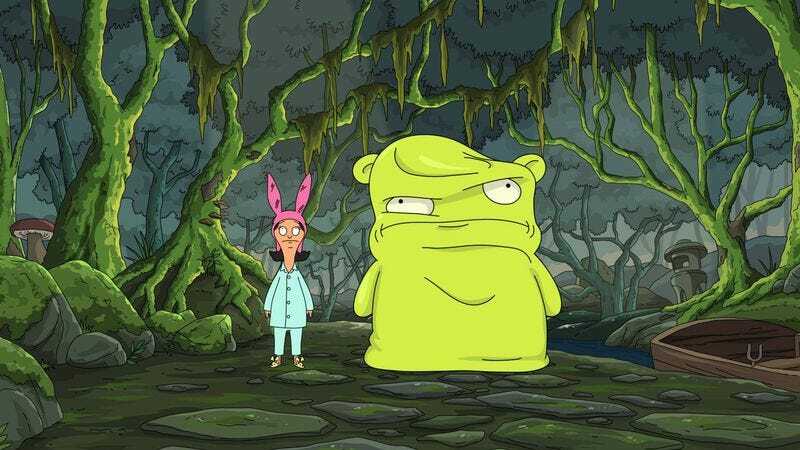 Good news for anyone who’s ever, say, rendered Bob’s Burgers’ eponymous griddle jockey and family as Cronenbergian blobs: The people who make Bob’s Burgers saw what you did there. And they liked it. And they’re inviting you to contribute your Belcher re-imaginings to the show’s upcoming eighth-season premiere. Over at the fittingly subtitled “Bob’s Fart” website (fitting because of Gene Belcher’s particular flatulence fixation, not the quality of the fan art—but possibly reflective of its content? ), the show is collecting submissions in three categories: title sequence animations, background static panel, and character static panel. Got a pun on your mind that would make a perfect Burger Of The Day? This might be the chance to put it on TV. An alternate-reality concept where Bob is a burger? Ditto. A still that makes Louise the protagonist of The Legend Of Zelda? Sorry, that one’s prohibited by the terms and conditions. All other non-trademark-infringing submissions will be accepted through 11:59 a.m. Pacific on March 13, 2017; season eight of Bob’s Burgers is set to debut sometime this fall.